Need an extension or to bring your family? We can assist you to submit your application for any temporary status that you need. Our services are designed to assist in re-uniting families. We can assist you with the preparation for both the sponsor and the applicant, advising you of what you need to present. Our services include both In-Canada and Outside Canada Sponsorships. 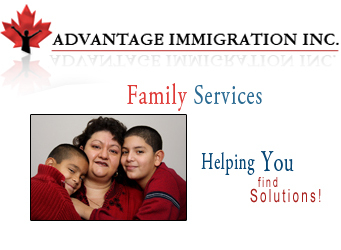 Now it is possible to sponsor additional family members that are not currently allowed under the Federal Immigration Program. You may bring skilled family members including brother/sisters, Aunts, Uncles and cousins. Some of the qualifications include settlement funds, English, post secondary and work experience. We can assist you with the process and ensure that your application is complete. Sometimes when you review the categories available, you may not immediately see anything that meets your needs. Citizenship and Immigration Canada does have allocations for special circumstances, such as orphaned children, seniors care needs and urgent family needs. We can assist you to identify if your situation meets this need. This category does not include Refugee status, which we do not represent.